Of all the mobile phones i have had before, there is only one that really catches my attention. 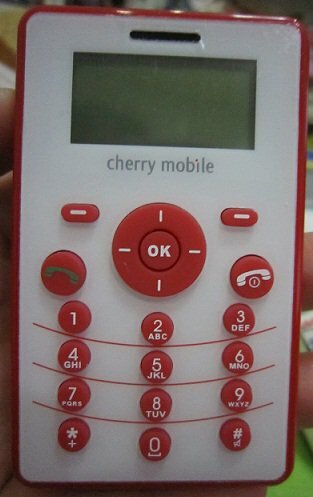 This Cherry Mobile phones. Its unique designs that makes it so special for me. Recently, i bought one unit of cherry mobile and its the P1. The only disadvantage to this phone is the text, if you have any difficulties of seeing, i won’t recommend this phone for you. The text are extremely small and you might end up texting or reading, putting the phone close to your eyes for you to see it. No games for you to play with and no FM radio built in and its just for text and call only. Battery life? hmmm as informed by the seller, if its on standby, it can take up to 5 days. But if you frequently using it, merely it can take up to 5-6 hours. So besure to bring with you a universal USB cable =). One big advantage is that, no one will ever thought its a cellphone. It does not look like one and its safe for you to bring it anywhere either on the jeepney or in any public areas. Its the lightest phone ever, its very handy and has a variety of colors to choose from. You don’t have to worry about the charger, it has a universal USB port at the right side and comes with a universal charger when you buy it. Im sure you can afford it, its just costing you P999 pesos. If i were to rate from 1-10, 10 is the highest. It would be 8. Quite good enough and practically speaking its a good phone.